Not all businesses believe that having a commercial cleaning company take care of their cleaning needs is essential. Some business owners tend to create their own cleaning crew among existing employees to handle their office’s cleaning needs. What they don’t realize is that having a professional cleaning company take care of their cleaning needs is actually the more economical option. More professional look – Because cleaning companies maintain businesses on a day-to-day basis, they are more meticulous in the cleaning process. It stands to reason that they will provide a more professional cleaning effort than existing workers who spend most of their day performing other tasks. Individuals employed by commercial cleaning companies often undergo extensive training and most have earned multiple certifications. Proper choice of cleaning agents and materials – Professional cleaners understand which cleaning agents work best with your floors and furniture without creating problems. They will be efficient and minimize any concerns about damages. Bacteria-free cleaning – Professional cleaners get rid of bacteria and other disease-causing substances that accumulate on your surfaces. Creates a healthier environment – When your office is properly cleaned, your working environment remains clean and safe. Workers will not be exposed to pathogens and contaminants that can make them sick. Increased productivity – With a healthier, cleaner, and aesthetically pleasing work environment, your employees will be more productive. Not only does a cleaner office provide a more appealing work environment, but it also leads to fewer sick days and fewer absences. Don’t settle for anything less than the best possible clean that you can get for your business. 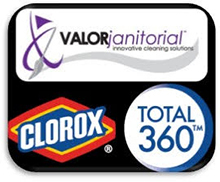 Reap the benefits of a commercial cleaning service in Dallas TX by hiring Valor Janitorial to keep your workplace spotless for a customer-friendly price. With years of experience in handling commercial cleaning and office cleaning tasks, you can rest assured that the kind of clean you want is what we provide. Aside from janitorial services, we also offer commercial carpet cleaning, window cleaning services, and floor polishing for all types of floors. All you need to do to get the professional clean your business needs is to contact us at 214-238-9550 and we will schedule you for a free assessment and estimate.